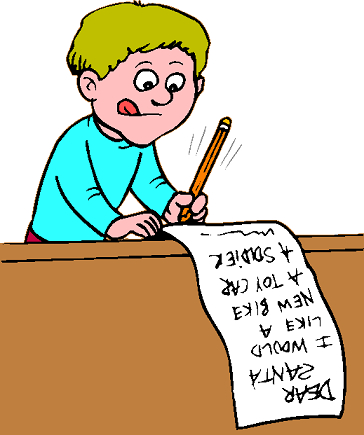 Today it is a common tradition for children to write letters to Santa Claus. Included with the letter, is a Christmas list. The Christmas list is a list of the Christmas presents that a child would like to receive. Santa Claus reportedly also maintains his own Christmas lists. Santa Claus keeps a list of all the children in the world, and which of them have been good (or nice), and which have been bad (naughty). Children who have been good (nice) will generally get nice presents. The presents are usually selected from the child's Christmas list. Children who have been bad (naughty) may get no presents, or, according to some traditions, an undesirable present such as a lump of coal! In summary, if you want good Christmas presents from Santa Claus, then you better be well-behaved, and nice!